Uncanny X-Men 221 VF+ Marvel Comics 1987 1st Mr Sinster KEY ISSUE!! 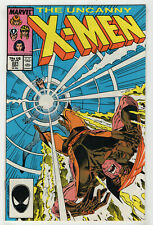 New ListingUNCANNY X-MEN #221 (First Mr. Sinister!) + NEW MUTANTS #87 (Cable!) + 15 more! UNCANNY X-MEN Vol.1 #221 1987 1st Mister Mr. Sinister NM 9.4. The Uncanny X-Men #221 (Sep 1987, Marvel) HIGH GRADE!!!! 16 product ratings - The Uncanny X-Men #221 (Sep 1987, Marvel) HIGH GRADE!!!! The Uncanny X-Men #221 CGC 9.2 1st Mister Sinister Essex! Hot! The Uncanny X-Men #221 (Sept 1987, Marvel) NM+ (9.6) 1st App. Mr Sinister! Key! 1)CGC 9.8-UNCANNY X-MEN #221(9/87)'1st MISTER SINISTER'(MARAUDERS)WOLVERINE/HOT! This page was last updated: 23-Apr 00:10. Number of bids and bid amounts may be slightly out of date. See each listing for international shipping options and costs.